← Death Valley? Meh. From boredom, maybe. So, I made a mistake. After bombing down Nevada 95 from Death Valley to The Vegas, I got confused and headed north on the I-15 instead of south. (I blame North Vegas’ highway construction and infuriatingly slow stoplights.) I wanted to catch the I-40 so we could head towards the Grand Canyon and see the skybridge. 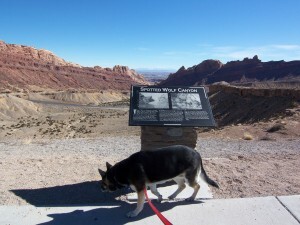 As is usual for me, I didn’t realize my error until I was well into Utah, and. as is even more typical, I decided to keep going and see what happened rather than backtrack. Ends up it was a pretty cool mistake to make. This part of the I-15 is gorgeous. It starts out as just more desert, then all of a sudden it looks like you’re headed straight for a canyon wall. At the last moment, the road swoops to the left and you slice into a narrow crevasse, just wide enough for the highway. The walls tower on both sides, like some forgotten gateway from Lord Of The Rings. And the wonders just keep coming. We then swung onto the I-70 eastbound, and it was just as good. Easily worth missing the Grand Canyon for. When everything was said and done, we covered the entire length of I-70, and it now ranks as one of the prettiest highways that I’ve driven on. Western Utah (on the I-15 and I-70), wow. Spectacular. Particularly going through Fishlake National Forest. Western Colorado, better, but still just OK.
Central Colorado, wow. A twisty run of mountain roads through forests and ski resorts. Sunrise on the snow-covered red rocks above the Colorado River can (re)affirm that there is a God. Vail Pass (10,666 feet) down to Denver is a serious rollercoaster. They had just re-opened the interstate right before we drove it, and there were a few icy spots. Nothing quite compares to hitting black ice on a 7% downhill grade at 70 per. I think that both Mayo and I have a few more gray hairs. At least you’re going fast enough that you’re over it and past before the car can get seriously sideways. Motorcycle nuts should not miss this thrill ride. But maybe not in February. I didn’t take many pictures of all the geological eye candy. There are a few scenic stops, but most of them are overlooks of some canyon or other. Most of the really cool stuff can only be seen as you roll past it. Which is OK, in a way, as it is like riding through some Disney theme coaster writ large. Besides, pictures won’t do justice; you really need to drive there and see for yourself. Another rant: I’m a fan of The Filthy Critic, who calls Arvada, CO his home. He makes it out to be some rundown mountain town, ala South Park. Ends up it’s really a sprawling suburb of Denver. And not even a little seedy. Well, maybe he lives in the part without Starbucks and Lowe’s. In case of not losing your way next time, a more fancy stuff is needed, GPS, but that’s not cost effective if we only use it for couple days but have it rested in home for almost a year. So, compass and updated paper map are a good combination.